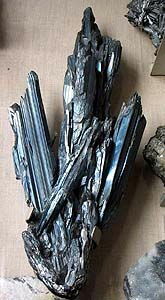 Antimonite, stibnite (stibium antimonial ore). Glance (glitter, glare) metallic, opaque. Fracture, break step to uneven. Fragile. Cleavage perfect absolute. Be found mainly in low temperature hydrothermal deposits. Crystals (rhombic Crystal structure) of pole, needle. Aggregates usually radiant, rarer dense, grainy. Important ore of antimony. Places of distribution: Germany, Yugoslavia, Algeria, Mexico, Bolivia, China, Japan, CIS. A antimonial ochre (stibiconite) arises up at oxidization of sulfides of antimony. Has a steel-grey color, opaque, with metallic off-gloss. 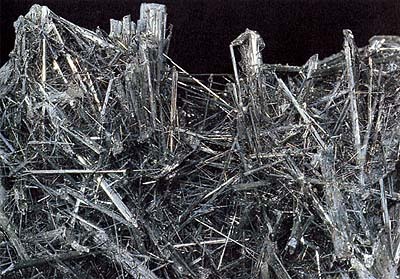 Antimonite is presented prismatic and needle-shaped crystals, sometimes bent, with shading parallell to lengthening. 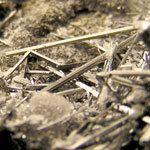 Often crystals are grouped in fibred-radiant aggregates; usually confusingly-fibred or dense the masses. A mineral is soft, heavy, with perfect cleavage, parallel lengthening. Crystals are flexible, but not elastic. Often covered iridescent tape, although in-bulk Antimonite sometimes transformed in red kermesite or other powdery minerals (antimonial ochres). It allows to distinguish Antimonite from a bismuthine. Single scales can be melted in flame of candle, that is another difference from a bismuthine which not melt fuse. 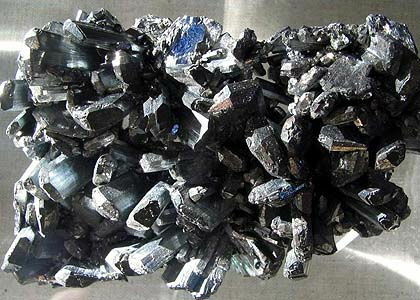 Antimonite - mineral of hydatogenesis. 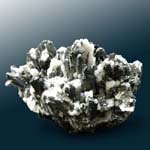 It is associated with the minerals of silver, lead, mercury; can be deposited also from solutions of mineral springs. 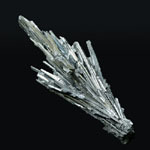 Magnificent crystals, long to 50 sm, were found on the deposit (now already exhaust) of Ichinokava (Japan). Other deposits, known the beautiful crystals of antimonite - Felshebanya and Kapnik in Romania, many areas in the state of Californium (USA) and on Borneo. Developed in the industrial scale of bed in provinces Hunan and Guandun in China, where Antimonite be found jointly with a cinnabar. Found out other deposits of commercial-size in Peru, Bolivia, Mexico and France. In Italy beautiful crystals are obtained in Toskane, in Rosia (a province Siena) and Nikolette (province of Grosseto), and also in Sardinia, where this mineral is presented as dense the masses. 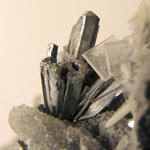 Antimonite matters very much as a source of receipt preparation of antimony. This element is used in different industries, including in the alloys of metals, and also in medicine. In a translation Antimonite means "against monks". In one of the European monasteries at fattening of pigs used pounded in powder of Antimonite, and a pig is enough grew fat not bad. From the best motives a cook decided to add this powder to the supper of the colleagues on a monastery, that monks also were well-fed and not thin. On a morning all of monks died from poisoning, and stone got the modern name. Antimonite. Sikoku of о., Japan. Brush of pinacoidal of prismatic crystals. Baya-sprie, Romania (EU). A photo: © A.A. Evseev.